The IT the methotrexate mentions on day 29 means InTrathecal, basically they injected it into his spinal fluid, via lumbar puncture. Always a good time at chemo. It is so good to know that we only have one more therapy session before we continue on to Standard delayed intensification therapy, and that’s only if Gages blood count is high enough to move on. Which from past experiences I know that treatment can be delayed for weeks on end. This round of therapy is similar to the consolidation therapy, he went through in the very beginning but Gage was in the hospital, having everything go wrong with him, we were more worried about him surviving complications to surgeries and infections. I honest to Jeebus can’t remember any part of consolidation therapy, also mid way through treatment Gages diagnoses was changed from aggressive treatment to standard treatment; due to complications from his pegaspargase. That complication was one of the best complications so far, just because they were able to reevaluate him and judge he was responding so well to treatment so his chemo doses were decreased and so now they aren’t as strong. Each course of maintenance proceeds as outlined below. Courses repeat every 84 days for a total of 2 years from the start of interim maintenance therapy for female patients and 3 years from the start of interim maintenance therapy for male patients. It just seems incredible to me that Gage, has undergone such dangerous treatments. Seriously, I have to inject these things into him on a daily basis, and yet I can’t even throw them in the trash because it is hazardous waste and totally illegal. But if this saves his life, then I am willing to do anything. Gage getting his dressing cleaned and changed. He is so awesome! 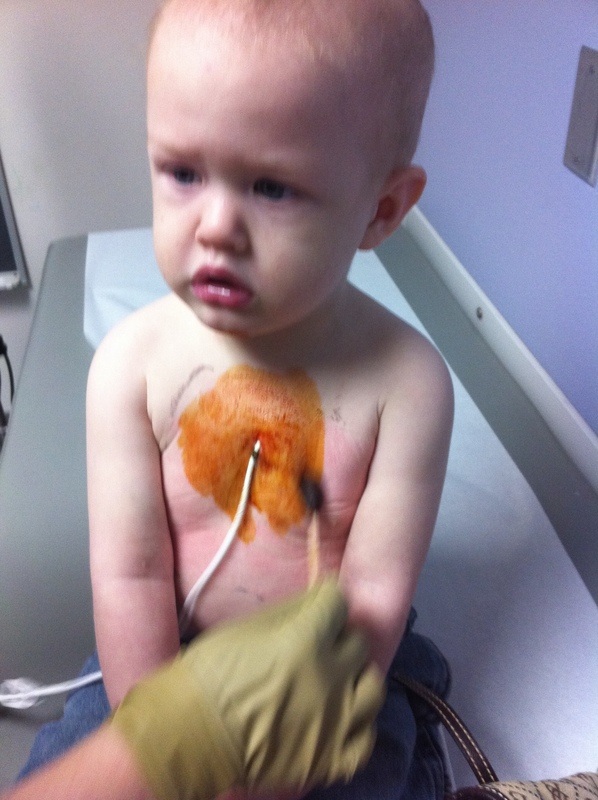 Oh, and yes, that tube is sticking out of his chest, it actually coils into his heart. He has the cutest face EVER! AH that just breaks my heart and at the same time causes me to just marvel at his (and your strength).